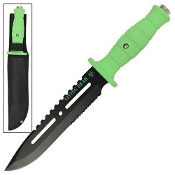 The "LIVING DEAD" survival knife is 1 heck of a knife! Stainless steel is used for a high quality material. This survival knife sports a razor sharp half serrated blade and a saw tooth back. The full tang is a single piece that spans through the handle for extra strength and includes a metal skull smasher on the end. Hard rubber green grips reduce slippage when wet. Includes a stiff nylon sheath that can be fixed to the belt for quick access.